You do not need to have a kitchen full of the latest gadgets to create delicious, healthy meals for you and your family. There are a few pieces of equipment that can really help you in the kitchen – with no pasta maker in sight! Multi-tasking kitchen equipment is worth its weight in gold. Unless you have pots of money and endless cupboard space (do these people exist?) then you really need to make sure that the kitchen helpers you invest in are able to do more than one random task that is only useful every seventy-fifth dinner party, and even then it takes longer to clean than actually going to Italy to buy pasta. You don’t have to spend a fortune on buying lots of fancy knives, but a really good, general purpose knife will make your life in the kitchen far easier. If you can afford it, or have a birthday coming up, a wooden block with a set of knives by a German or Japanese maker is certainly worth buying. As long as you keep them dry, sharp and clean, your knives will serve you well for many years to come. 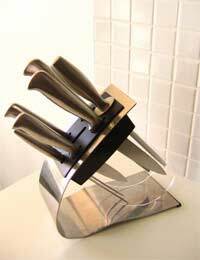 A good set of knives, or one general purpose knife, are great at kitchen multi tasking. You don’t need lots of fancy graters or processors when you have good knives, not to mention all those crazy boiled egg choppers and random gadgets you see in the little catalogues that fall out of Sunday newspaper supplements. Okay, so we all know that Tupperware isn’t exactly fashionable and you may not choose to have your collection on show when your new boyfriend comes round, but they are really great kitchen multitasking items! A good set of Tupperware has a number of different sizes, all with tight fitting lids. The joy of Tupperware is that it is freezer, microwave and dishwasher safe, so it is perfect for storing leftovers and freezing portions of food – great for taking to work. Tupperware is a kitchen multi- because it helps you make the most of the food you buy – no more half tins of sweet corn being thrown away – just pop them in a little Tupperware and they’re ready to add to a salad or pasta dish within the next three days! You can also store your herbs, spices and cereals etc in these little plastic gems. You can easily buy a decent quality hand held blender for less than twenty pounds. Although it’s not a great idea to fill your kitchen with cooking equipment, the odd piece will help you immeasurably – the trick is knowing which ones. A hand held blender is great because it can be used for lots of different purposes – an important factor in the multitasking requirements. You can use your hand held blender for making quick, tasty soups – just boil some chopped vegetables in some stock (peas and ham stock works well, as does sweet potatoes with chicken stock and chillies) and then blend. Take care to take the pan off the heat first and keep the whole of the head of the blender submerged while blending to stop hot splatters. You can also use your hand held blender for mixing cakes, salsas, salad dressings and meringues.